Supergirl introduces Superman’s nemesis, Lex Luthor as J’Onn continues his relentless pursuit of Manchester Black. I’ve talked at length about how problematic the Manchester Black plot is. My main issue with it is how flimsy his motivation is and how little the writers seem to care about making this work. Manchester Black’s fixation on bringing out J’Onn’s violent instincts just isn’t working as it doesn’t really seem to come from anywhere. With more work this could have been great as David Ajala and David Harewood are both talented actors who do the best with the flimsy material they have been given. This rivalry connects to the mystery of who shot James through the assumption on J’Onn’s part that Manchester Black is responsible after he promised to come after everyone he cared about. It’s a reasonable conclusion to come to but also acts as an excuse for this to be part of the episode rather than being organically connected. It basically keeps J’Onn busy while everyone else worries about what will happen to James. Adding Kara to this plot makes her something of a bystander within the episode as well but I’ll get to that part later in the review. Manchester Black is in theory a compelling character and it’s a good enough idea for the writers to have a pro-alien extremist to act as a contrast to the anti-alien extremists. It’s a way of showing that people can do terrible things in service of what they believe in no matter what that belief is. This could make for a strong message that Kara may be fighting a conflict on two fronts and that there will be people that will make her personal stance look bad. The execution of this is just sloppy as there’s no real method to Manchester Black’s madness. His fixation with J’Onn makes no real sense as there wasn’t enough work done earlier in the season to establish a strong bond between them that might make Manchester’s desire to corrupt him make sense. They were both apparently very close to Fiona but we saw little evidence of that so it comes across as a plot contrivance more than anything else. His plan this week is to destroy a dam after desecrating the grave of J’Onn’s father in order to get a hold of a sacred staff that grants him vague abilities. More should have been made of the shock value around what Manchester did to M’yrnn’s grave but it doesn’t come across as all that big a deal. It is treated as something that J’Onn is enraged by though I expected it to inform more of their conflict along the lines of it being the sign of a personal boundary being crossed as an indication that Manchester may be beyond redemption. As presented it’s just another thing that happens and isn’t given the weight that it really deserves considering what Manchester did. His plan to destroy a dam is needlessly diabolical and doesn’t really fit his pro-alien agenda in any way that makes sense. At this point it seems that he’s simply doing bad things because that’s how he expresses himself now. It is mentioned that he is trying to get to J’Onn but there’s absolutely no nuance to any of this. When Manchester was introduced he was a peace loving pacifist who valued life and now he’s looking to do widespread damage to the city simply to goad J’Onn into embracing his more violent side. He’s now more of a plot contrivance than a character and it’s really a waste of what could have been an engaging antagonist. This episode seems to be the end of him though I wouldn’t be surprised if that was a red herring of some sort judging by how calmly he reacts to his apparent disintegration. If he is gone then it’s absolutely for the best since the handling of this character was so problematic but at the same time it’s such a haphazard exit that isn’t at all satisfying, The follow-up to it with J’Onn feeling shame and guilt over his actions makes some sense given that he has been trying to find a way of life that works for him and turn his back on violence. He clearly feels forced into a situation where the only option he had was to kill Manchester and that makes him doubt himself in a really profound way. Kara tries to console him by reminding him of what was at stake and suggesting that he did the right thing but J’Onn clearly isn’t ready to hear it and has a lot to work through before figuring out what his next steps are. Once again, David Harewood’s performance sells this wonderfully but it would be a lot better if the background details were stronger. The introduction of Lex Luthor (Jon Cryer) is something that many fans have been anticipating for a long time. This first appearance of Lex is seen through Lena’s eyes which makes sense as she is who audiences are familiar with so her perspective on him is the best way to explore who he is and what he means to her. The opening scene of the episode shows Lex just before he was arrested for bathing Earth in the light of a red sun to deprive Superman of his powers. Monitors show widespread destruction and Lex monologues about being jealous of Superman for stealing his thunder as “The Man of Tomorrow”. All in all it’s a somewhat pointless scene in the context of the episode but in the broader context of Lex as a character it shows him at the height of his power and arrogance before being reintroduced as the feeble dying husk that defines most of his portrayal in this episode. Lex is dying because he exposed himself to too much Kryptonite and gave himself Cancer. The episode doesn’t address this but this could be a reference to the Icarus myth with Lex being damaged by his own arrogance and ambition. 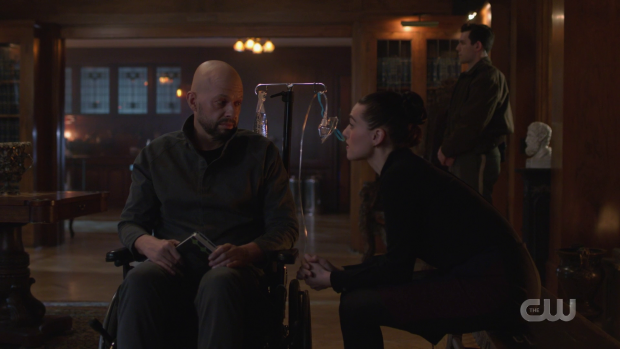 Having him in this condition allows the focus to be on the sibling relationship between Lena and Lex with Lena being somewhat in control of it. She has the opportunity to tell Lex how she feels and make it clear that the path she has chosen is better than the one he chose. With this being Lex Luthor the writers have to be mindful of the fact that he always has a scheme up his sleeve and is among the best at manipulating others so every conversation has this undercurrent of menace to it because it’s clear that Lex is up to something though it’s never clear what that is. 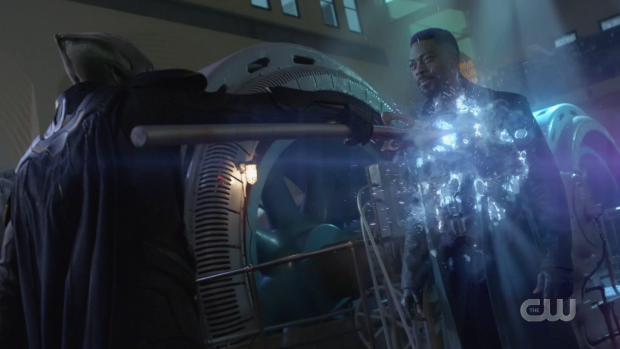 Naturally his main objective here is to prevent himself from dying and Lena’s Harun-El research is the best chance he has of achieving that goal. He manoeuvres himself into a situation where he can work directly with Lena so that he can lend his genius to the process of perfecting the serum. It turns out that Lena has been in contact with Lex throughout her research which seems a bit bizarre as reveals go but if it allows the writers to move past the time it will take to bring Lex up to speed and get to the meat of the interactions then that’s something I can definitely accept. The episode doesn’t shy away from the complexity of the Lena/Lex relationship. It’s clear from numerous interactions between Lena and their mother that it was a very competitive upbringing but having Lex as part of the conversation adds greater context. There is one very thoughtful moment where Lex talks about going on a business trip with their father and meeting Lena’s mother. This was significant because Lex noticed that the relationship was a loving one instead of the toxic connection that existed between his father and mother. He is able to assure Lena that she was a product of love and represents the best parts of the Luthor family because of that. There are other scenes that further explore their connection through digs they have at one another about their intelligence and effectiveness that reinforce the different facets that make up their relationship. Jon Cryer is a great Lex. At all times he appears arrogant and completely in control of the situation though he isn’t above compassion when it suits him and appears to have genuine affection for Lena that exists as a result of the clear respect that he has for her. The fact that he has been playing her the whole time will surprise no one but it’s delivered in such a way that it feels like a shock at the time because Lena clearly thought she had considered everything in making sure that Lex couldn’t take control of the situation and escape but it turns out that he was just waiting for his moment all along. Lex’ escape was masterfully handled from the reveal that he had orchestrated a series of events including James being shot in order to give Lena the push she needed to finish the Harun-El serum. Once that is accomplished he’s all too happy to reveal his evil plan and takes joy in the fact that he was able to outwit Lena. 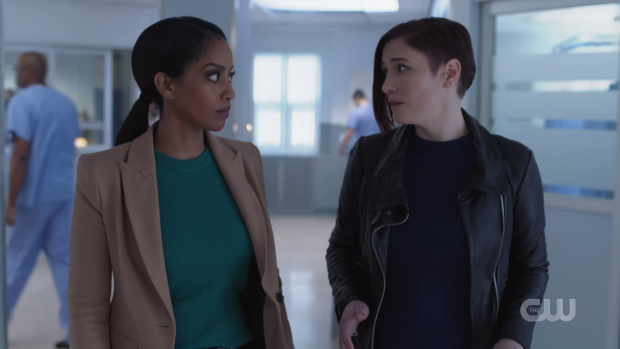 The secondary reveal that Eve had been working with Lex all along was an impressive shock as well as she had been in the background for long enough to feel developed enough in her own right as a version of this character not connected to Lex. It’s not something I’ve ever talked about but I like the way Eve conducts herself by playing into the notion that people make assumptions about her intelligence based on her looks. She managed to fool Lena with an alteration of that. This final scene cements Jon Cryer as a worthy version of Lex Luthor as it got to the point where I was almost convinced that there was no way he could take control of the situation. He is as crafty as he is charismatic and certainly has a lot of potential to shake things up in the coming episodes as well as give Lena a personal antagonist to deal with. This is a great showcase for the character though it’s a pity we’re unlikely to see him interact with Clark. Even though this episode is notionally built around the ticking clock associated with James’ injury it doesn’t feel as urgent as it needs to. Yes it does propel the other stories onward though they still feel separated and it’s Alex left picking up the pieces of the James narrative despite not being all that close to him at any point. The introduction of James’ sister Kelly (Azie Tesfai) feels somewhat superfluous outside of the legal need for a next of kin to make decisions. He main purpose is to disagree with Alex’ suggestions until the crucial moment where she takes a leap of faith and talk about how she doesn’t know her brother all that well. It all makes James come across as less than the priority despite the current crisis stemming from his situation. It’s even wrapped up awkwardly with comedic reluctance to talk to his mother over the phone. James just isn’t as important to the show as the writers want him to be. The current crisis ends up becoming a development point for the Brainy/Nia relationship. Brainy is consumed by grief as every difficult experience across his entire life comes rushing back to him and he’s unable to find a way to resolve this internally. 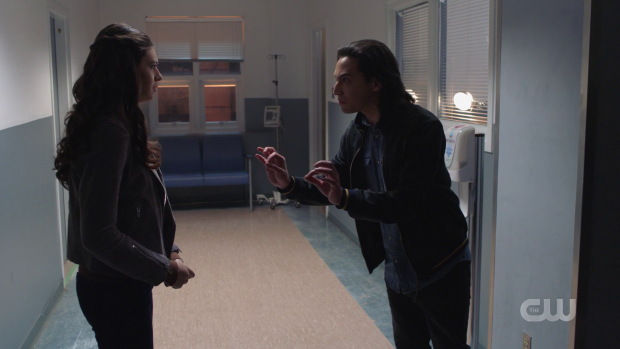 Nia tries to make him feel better by kissing him which only seems to add to Brainy’s problems as he has to tell her that they can’t be together. The strong the implication is that getting together would cause issues with the timeline. This is a classic CW transparent attempt to prolong the will they/won’t they narrative for these characters and it’s less than interesting. 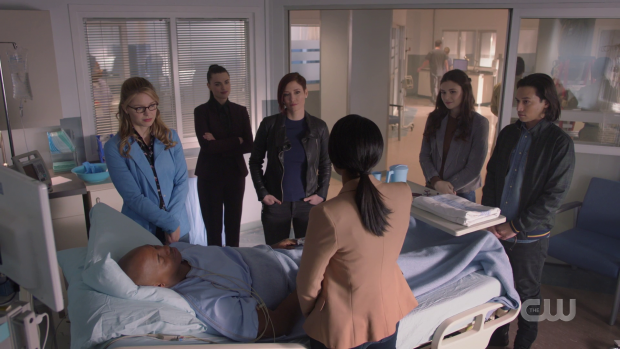 This episode proves that there is still mileage to Alex no longer knowing that Kara is Supergirl. She is confused as to why Kara has to leave with J’Onn and manages to find out that she was lying about going to CatCo. In this case it’s easy to cover up as Kara is able to talk about not being ready to face James in his injured state which is a very natural way to feel when a loved one is at risk of death. Alex accepts Kara’s weakness and the tension in their relationship is resolved but it serves as a reminder that there are only a finite number of excuses that Kara can give before Alex will start asking relevant questions. A strong episode that makes up for the weaknesses in the Manchester Black plot with an excellent introduction for Lex Luthor. The antagonistic relationship between J’Onn and Manchester Black feels completely unearned and always has but is especially problematic here as Manchester Black’s actions make no logical sense. Having him desecrate the grave of J’Onn’s father is one thing and should have been more impactful than it ultimately turned out to be but setting out to destroy a dam and threaten the entire city only confirms how problematic this character is as nothing about him suggests that this would be an action he would take. J’Onn being forced to put a permanent end to him works well enough in terms of David Harewood’s performance and the struggle he has with figuring out what his next steps are but the background wasn’t strong enough for this to work as well as it needed to. Despite the events of this episode springing from James’ injury it feels less than important. Having Alex anchor this part of the plot just comes across as odd and the introduction of Jame’s sister, Kelly is fairly pointless outside of the legal need for next of kin. She largely exists to disagree with Alex and talk about not knowing her brother all that well but all this really does is make it clear that James isn’t as important to the show as the writers need him to be. This episode finally introduces Lex Luthor and Jon Cryer crafts a worthy version of this character. The writers don’t shy away of the complexity of his relationship with Lena and the moment he reveals that Lena has been playing into his hands perfectly was handled brilliantly. 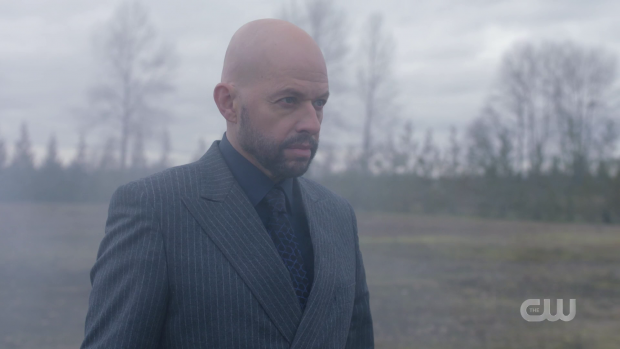 Jon Cryer’s performance is layered and the character is written really well so should make for an engaging antagonist over the coming episodes.